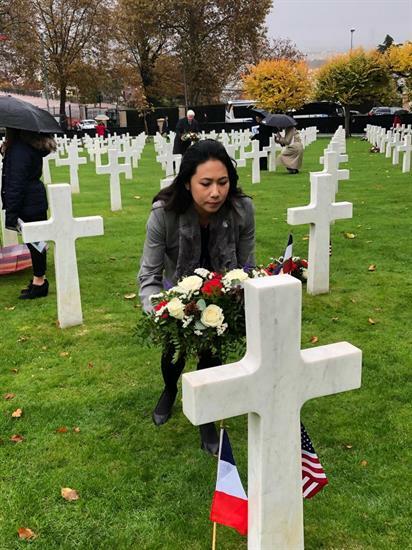 SURESNES, FRANCE – To commemorate 100 years since the end of World War I, and to honor U.S. military veterans on Veterans Day weekend, U.S. Congresswoman Stephanie Murphy, D-Fla., a member of the House Armed Services Committee, visited an American military cemetery outside of Paris and laid a wreath at the gravesite of a Florida native who lost his life in the "Great War." The soldier, First Lieutenant Louis Alexander Torres, served in the U.S. Army's Quartermaster Corps and passed away on Sept. 1, 1918. In addition to laying the wreath, Murphy participated alongside Members of Congress in a bipartisan ceremony to honor American servicemembers who died in World War I.
Murphy and approximately 30 other Members of Congress are in Paris as part of the Franklin Center’s and The Ripon Society’s 34th Annual Transatlantic Capital to Capital Exchange, where U.S. officials, French officials, and private sector leaders will discuss a wide variety of public policy issues, such as energy, trade, terrorism, and foreign policy. Murphy will appear on a panel alongside House Armed Services Committee Chair Mac Thornberry, R-Tex., to discuss the future of the North Atlantic Treaty Organization (NATO), the military alliance between the United States, Canada, and 27 European nations.